Lock in a great price for CAPE 9 Villas & Suites – rated 9.5 by recent guests! heated pool, amazing massage, convenient breakfast. All of there recomendations were perfect! They were quick to respond to everything we would ask for. The massage was AMAZING!! The pool was really clean and came with an AMAZING view of the island. The accomodations and amenities far exceeded what we were expecting. The staff was extremely competent and provided us several excellent recommendations from food to views and everything in between. We will be staying here again. I loved everything about this property. Our villa was amazing the design of the villa was so relaxing. The view was too extraordinary for description; just beautiful. The staff were so nice and made sure we enjoyed our stay. We have stayed the night before at a more expensive resort and took so many pictures. However, our family and friends only were amazed of the cape9 pictures although it was 3 times cheaper than the other resort. We really recommend cap9 and will be back again. Thanks to all the staff of cap9. CAPE 9 Villas & Suites This rating is a reflection of how the property compares to the industry standard when it comes to price, facilities and services available. It's based on a self-evaluation by the property. Use this rating to help choose your stay! 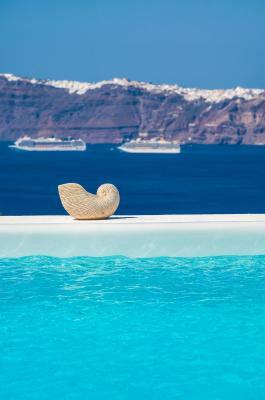 One of our top picks in Akrotiri.Offering breathtaking views of the Caldera, 2 outdoor pools and large private gardens, CAPE 9 Suites & Villas is a boutique property located in Akotiri. Free parking is available. 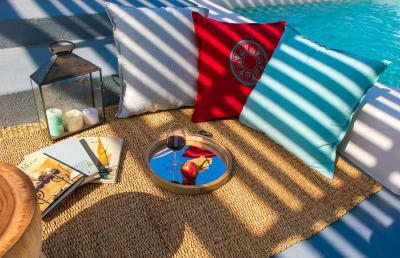 Each unit of the 5-star accommodations features its own private patio complete with a plunge pool and relaxing outdoor lounge areas. 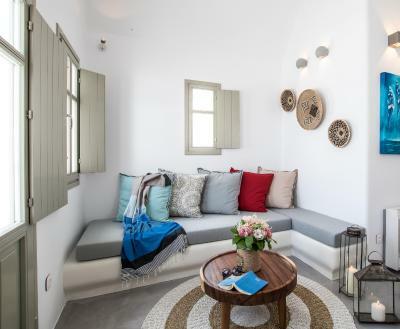 The modern interiors include 1 or 2 large bedrooms with traditional built beds, sitting and dining area, a flat screen TV with cable channels, a mini bar, a wine cooler with a special selection of Santorini wines, an espresso making machine and a kettle. Guests may enjoy a specially designed breakfast with homemade treats that is served in the privacy of their property. You can enjoy a variety of delicious meals and beverages, served by the pool area or in the private patios and pools. 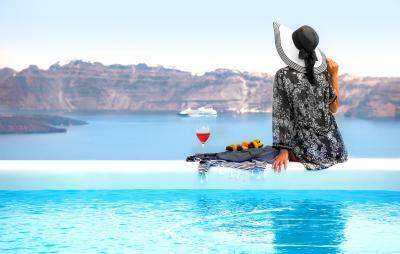 Sun loungers, umbrellas and sitting areas are provided by the 2 large pools. Cape 9 also offers beauty and massage services for individuals or couples and a special pampering program for brides. A bus stop can be reached within 350 feet from the property. Santorini Airport is 5 mi away while Athinios Port can be found 2.5 mi away. 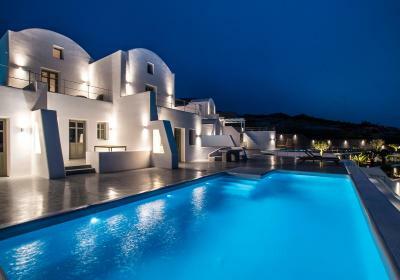 When would you like to stay at CAPE 9 Villas & Suites? 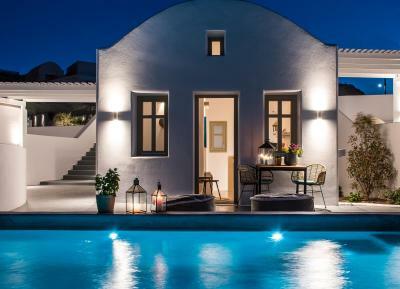 Modernly decorated villa with a large patio, an outdoor plunge pool and a traditionally built outdoor dining area. 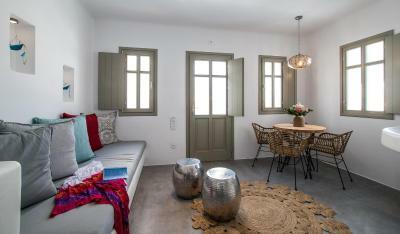 It features 2 bedrooms, 2 bathrooms, and a modern living room with dining area and flat-screen TV. 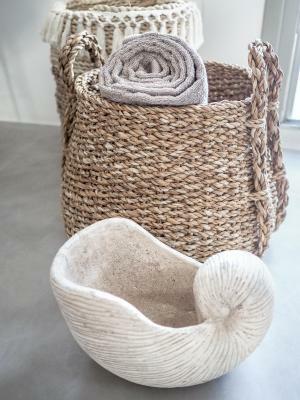 House Rules CAPE 9 Villas & Suites takes special requests – add in the next step! 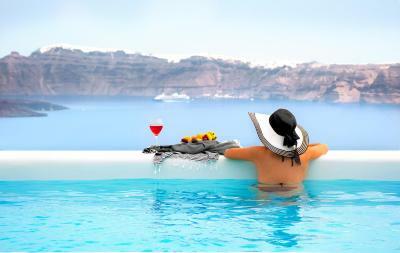 CAPE 9 Villas &amp; Suites accepts these cards and reserves the right to temporarily hold an amount prior to arrival. CAPE 9 Villas & Suites accepts these cards and reserves the right to temporarily hold an amount prior to arrival. Please inform CAPE 9 Villas & Suites of your expected arrival time in advance. You can use the Special Requests box when booking, or contact the property directly using the contact details in your confirmation. A bit of a windy spot and out of the way of the main towns. Amazing breakfast and food. The staff was amazing with helpful recommendations and quick response time. Cozy beds and the amenities you need for a pleasant stay. The breakfast was amazing and there was a great view from the villa. the room were really beautiful and the staff were very friendly and helpful. 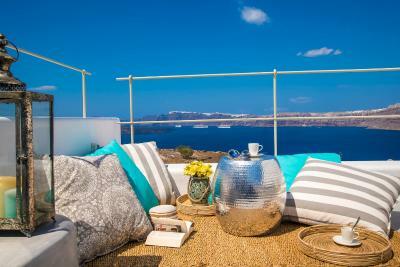 Absolutely beautiful apartments overlooking the Caldera. 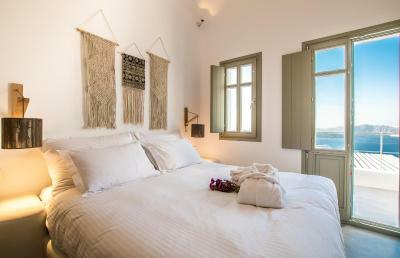 We were greeted with a honeymoon suite (number 9) as well as a bottle of champagne and Greek treats for our honeymoon! The owners checked in with us each day and were a fantastic help for getting around Santorini as they offered lots of helpful advise. We didn’t want to leave!! Will definitely be back, hopefully sooner rather than later! The staff , facilities, and location. Everything was amazing thanks for an amazing vacation. Special thanks to Cesar. The stuff are amazing! The price is totally fair, the hotel is super beautiful and clean. Over our expectations! We will definitely come back! Such a beautiful location. Super recommend! The weather could have been warmer, but who can change that. Everything was fairly perfect. If I were to make one alteration it would have been for our private pool to be heated. The property is fantastic and beautifully maintained. Enjoyed the stay . Everything else. Staff is very helpful, place is absolutely brilliant. The view is unbelivable! The only negative is our private Jacuzzi was not working which was disappointing and the cleaners did not speak English, just a little bit of English is would be great. Friendly and polite staff, beautiful location, perfect accommodation. Food and drinks at your disposal, good room service. Cleanliness is excellent, includes the the whole compound. Swimming pool also clean and always ready to use. Last but not least you feel at your own house and no pressure from staff at all. Privacy and respect is also ensured my staff. It was a holiday expected and really enjoyed with my family. They have good links around where you want to go for entertainment, let them know and this will be organised for you. Hot tub/pool was not heated. Would have been nice if it was. The property was excellent, very clean and comfortable. Breakfast was also good.